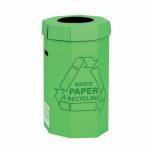 Acorn Cardboard Recycling Bin 60 Litre Green (Pack of 5) 402565 Pack of 1 60 litre green bin for recycling waste paper, manufactured from 90% recycled material. Supplied flat packed and easy to assemble. H677 x W360mm. 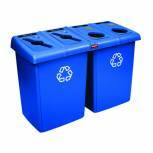 Addis Recycling Bin Kit (Pack of 3) 505575/505574 Pack of 1 Addis pack of three recycling bins. Each bin has a colour coded lid and label to identify the contents to be recycled. Use to sort paper, plastics and aluminium cans. 54 litre capacity. 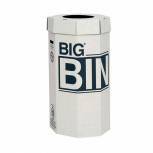 Acorn Big Bin Cardboard Recycling Bin 160 Litre (Pack of 5) 142958 Pack of 5 Produced from biodegradable, recycled material. Comes flat packed. Ideal for offices, computer rooms, warehouses, graphic studios, exhibitions or temporary outdoor events. 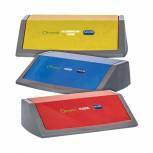 Utilise a number of bins to separate and recycle office waste. H36, W18. 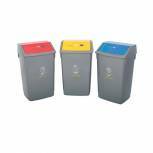 Acorn Cartridge Recycling Bin 60 Litre Black/Yellow (Pack of 5) 059783 Pack of 1 Cartridge Recycling Bin. Manufactured from around 80% recycled cardboard with a patented drop out bottom allowing the bins to be emptied from the bottom reducing the risk of back injury when lifting heavy loads. W360 x H677mm. 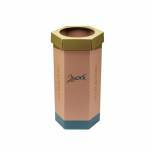 Acorn Office Twin Recycling Bin Blue/Green 802853 Pack of 1 Acorn twin recycling bin. 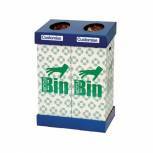 Compact recycling unit with two 95 litre compartments allow separation of two materials of your choice. Blank panels on the front for labelling. 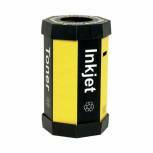 Pre-printed and blank labels supplied. Dimensions: W640 x D420 x H920mm. 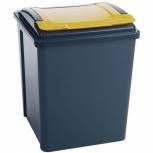 VFM Recycling Bin With Lid 50 Litre Yellow 384287 Pack of 1 VFM Recycling Bin. Yellow. Capacity: 50 Litres. Size: 40x39.5x51cm. Colour coded bin ideal for all your recycling needs. 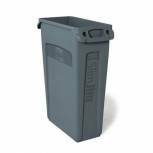 Rubbermaid Slim Jim Venting Channel Container 87 Litre Grey 3540-60-GRY Pack of 1 Integrated venting channels which take the strain out of liner removal. Moulded-in handles and base grips making lifting and emptying easier. Moulded-in drag rim on the bottom provides added durability. Lids available separately. Grey 87 litre. Rubbermaid Slim Jim Venting Channel Container 87 Litre Green 3540-07-GRN Pack of 1 Integrated venting channels which take the strain out of liner removal. Moulded-in handles and base grips making lifting and emptying easier. Moulded-in drag rim on the bottom provides added durability. Lids available separately. Green 87 litre. 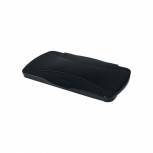 Rubbermaid Slim Jim Swing Lid Black 2673-60-BLA Pack of 1 Suitable for use with Slim Jim Containers and Venting Channel units. Keeps waste out of sight and allows use without touching. Reinforced rims for added strength and durability. Colour - Black. 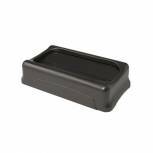 Rubbermaid Slim Jim Hinged Lid Black 2674-00-BLA Pack of 1 Suitable for use with Slim Jim Containers and Venting Channel units. Hinged bin lid in closed position fully covers contents, in open position hinges 270 degrees. Reinforced rims for added strength and durability. Colour - Black. 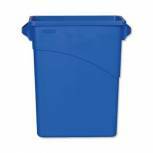 Rubbermaid Slim Jim Container Recycling 60 Litre Blue 1971257 Pack of 1 60 Litre Slim Jim Container. Efficient size and shape for tight spaces. Durable, will not rust, chip or peel. Does not contain latex. Contains post consumer recycled material. Lids available separately. Blue with recycling symbol. Rubbermaid Slim Jim Bin Lid Bottles Red 2692-88-RED Pack of 1 Suitable for use with Slim Jim Containers and Venting Channel units. Allows effective waste separation and recycling. Reinforced rims for added strength and durability. Red lid with round holes for cans and bottles. 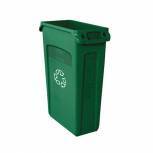 VFM Recycling Bin With Lid 50 Litre Green 384288 Pack of 1 VFM Recycling Bin. Green. Capacity: 50 Litres. Size: 40x39.5x51cm. Colour coded bin ideal for all your recycling needs. 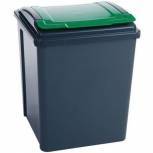 VFM Recycling Bin With Lid 50 Litre Red 384289 Pack of 1 VFM Recycling Bin. Red. Capacity: 50 Litres. Size: 40x39.5x51cm. Colour coded bin ideal for all your recycling needs. VFM Recycling Bin With Lid 50 Litre Blue 384290 Pack of 1 VFM Recycling Bin. Blue Grey/Blue. Capacity: 50 Litres. Size: 40x39.5x51cm. Colour coded bin ideal for all your recycling needs. 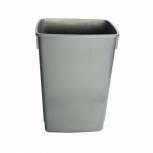 Addis Grey 54 Litre Recycling Bin Kit Base Metallic (Pack of 3) 505574 Pack of 1 Addis pack of three Recycling Bins. Use to sort paper, plastics and aluminium cans. 54 litre capacity. 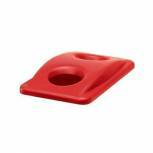 Addis Red/Yellow/Blue Recycling Bin Kit Lids Metallic (Pack of 3) 505575 Pack of 1 Addis pack of three Recycling Bin Lids. Each lid is colour coded and has a label to identify the contents to be recycled. Use to sort paper, plastics and aluminium cans. (Complete bin illustrated). 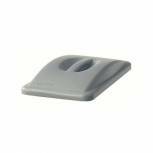 Rubbermaid Slim Jim Handle Top Lid Grey 2688-88-GRY Pack of 1 Suitable for use with Slim Jim Containers. Reinforced rims for added strength and durability. Handle design. Colour - Grey.